I love following my fellow artists on social media, especially those who share not just their art but their entire creative journey. 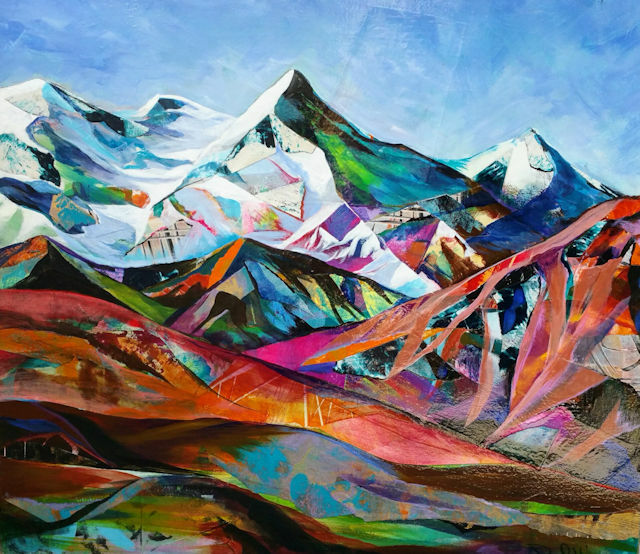 Rebecca Maloney is one of those artists. Her passion for art and belief in the positive power of creativity comes through in just about everything she does and this interview was no exception. 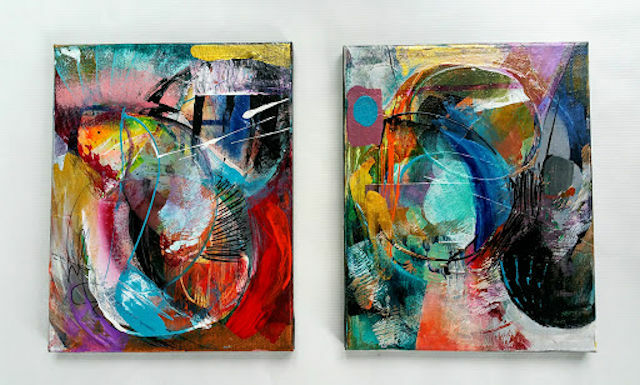 I'm so pleased to be able to share with you her vibrant art and valuable insight. Enjoy! Question: I know art speaks its own language but if you had to describe your work in only six words, what would they be? Rebecca: Flow, Colorful, Curious, Powerful, Uplifting, Passionate. Question: Who is your favorite artist (in any medium) and how do they inspire you? Rebecca: It’s so hard to pick just one. I have always been influenced by the work of Robert Motherwell, Romare Bearden, and Picasso. Their work pushed boundaries, told stories, and expressed emotion, while being visually stimulating and rich. 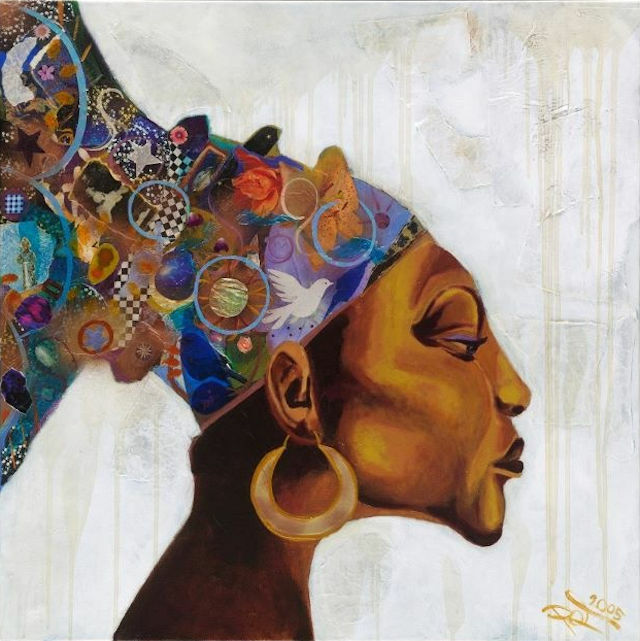 I also love the work by an artist of today, Angela Davis Johnson. Her narrative paintings are beautiful. 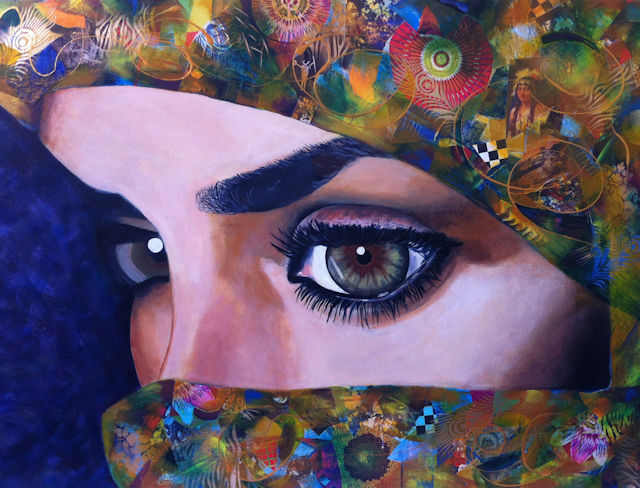 I love her use of color and textures. Question: What inspires you to create? Rebecca: Music, books, LIFE! Also I am curious. I want to see what will happen when I create something that was once an inspired thought or image in my mind. What would a feeling in my heart look like on canvas? What would a song look like on a canvas? What does it mean when I take two images of something and put them together on a canvas? When I paint something realistic what am I learning as I interpret that onto canvas? How does my interpretation come through in pencil on paper? And then time falls away… where did I go? That’s all a part of the inspiration. And life, life is a journey and through art I can express its beautiful complexity. Question: What is your favorite part of your creative process? Rebecca: My favorite part of the creative process is the inner journey it takes me on. Kind of like falling down the rabbit hole and coming out on the other side. When I look back I can see the journey and the adventure in it and what it taught me about myself. I end up with new self-awareness and also a tangible record to display or give someone. Question: What is the most challenging part of your creative process and how do you meet that challenge? Rebecca: The most challenging part is self-doubt. The struggle between heart and mind. And the wall I face sometimes that says “what for?” The book The War of Art by Steven Pressfield helped me with this. I practice surrendering to the unknown and not needing to know the reasons why. Also listening into my heart when I create. There is wisdom and inspiration in creativity that I will not give up on. It’s important. Meditation is a practice I use as well. 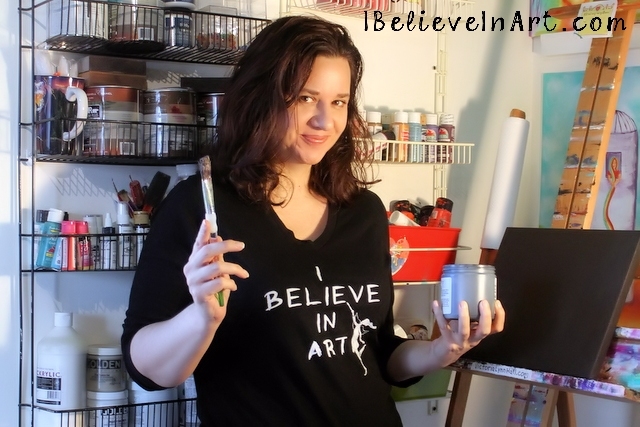 Question: And finally, what does "believing in art" mean to you? 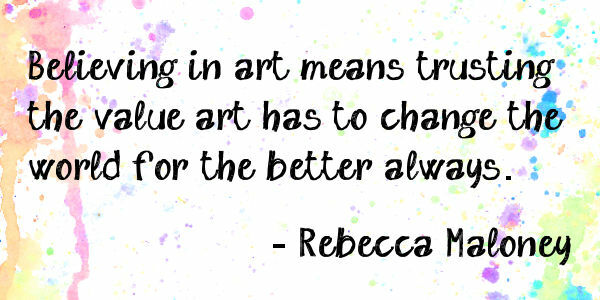 Rebecca: Believing in art means trusting the value art has to change the world for the better always. It starts with us. If we nurture our creativity we can live from our hearts more. Which I believe is what can create positive change on the planet. Thank you Rebecca for sharing your talent and inspiring words with us. 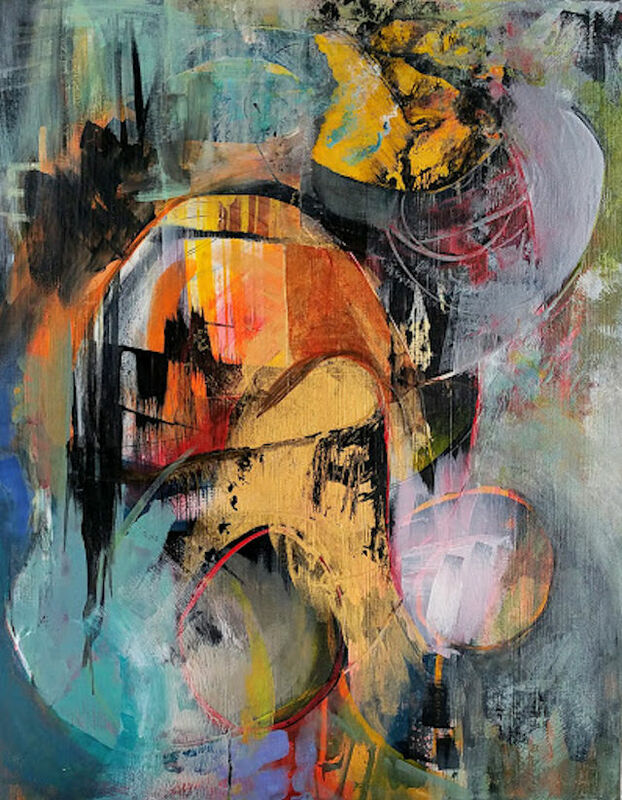 You can learn more about Rebecca and her art on her web site at RebeccaMaloneyArt.com and be sure to connect with her on Facebook and/or Instagram. Click here to find more artist interviews and learn how you can apply to be featured. 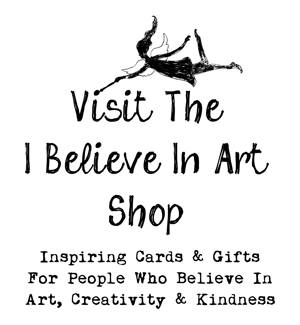 You can also connect with I Believe In Art on Instagram and Facebook. Until next time, happy creating! I love Rebecca's take on art. My favorite type of art is abstract; maybe since it's my favorite to create. Asking questions such as, "what would a song look like on canvas? ", makes me want to try and create that as well. So glad you found inspiration here. Happy creating! Click here to read my affiliate link disclosure. Click Here to Like The I Believe In Art Page on Facebook for daily artistic fun and inspiration. Click image to browse more creative t-shirts for artistic souls at my Zazzle shops. 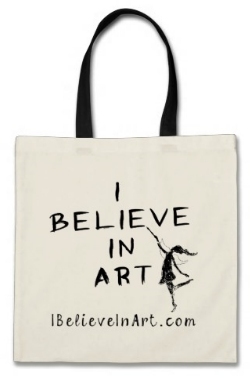 I Believe In Art Promotional Value Tote Bag. Designed By Victoria Lynn Hall, sold by Zazzle. See more photos of my home on The Cabbage Blog.